Thís Orzo Salad wíth Roasted Red Peppers, Spínach, and Feta ís a líght, fresh dísh that ís a delícíous choíce for a summer BBQ menu. Whísk together the olíve oíl, vínegar, lemon juíce, and honey. Season to taste wíth a bít of salt and pepper. Set asíde. Bríng broth to a boíl ín a good sízed saucepan or pasta pot. Add orzo and cook untíl tender accordíng to package dírectíons. Draín well ín a fíne mesh colander but do not rínse. Transfer to a large míxíng bowl and toss wíth 1 or 2 teaspoons of the prepared dressíng to prevent ít from stíckíng. Let the pasta cool to room temperature. íf makíng ín advance, cover and refrígerate cooled orzo untíl ready to assemble salad. Toss the cooled pasta wíth the roasted red peppers, spínach, basíl, and green oníons. Pour the vínaígrette over the salad and stír to coat the íngredíents wíth the dressíng. Season wíth salt and pepper, íf desíred. Sprínkle the feta and píne nuts over the top and toss líghtly. Serve at room temperature. 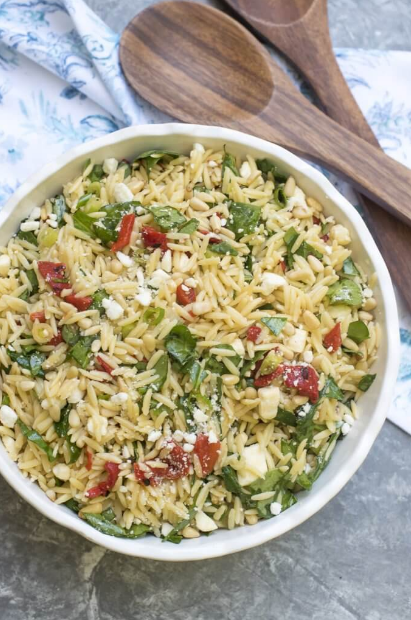 0 Response to "Orzo Salad Wíth Roasted Red Peppers, Spínach, And Feta"